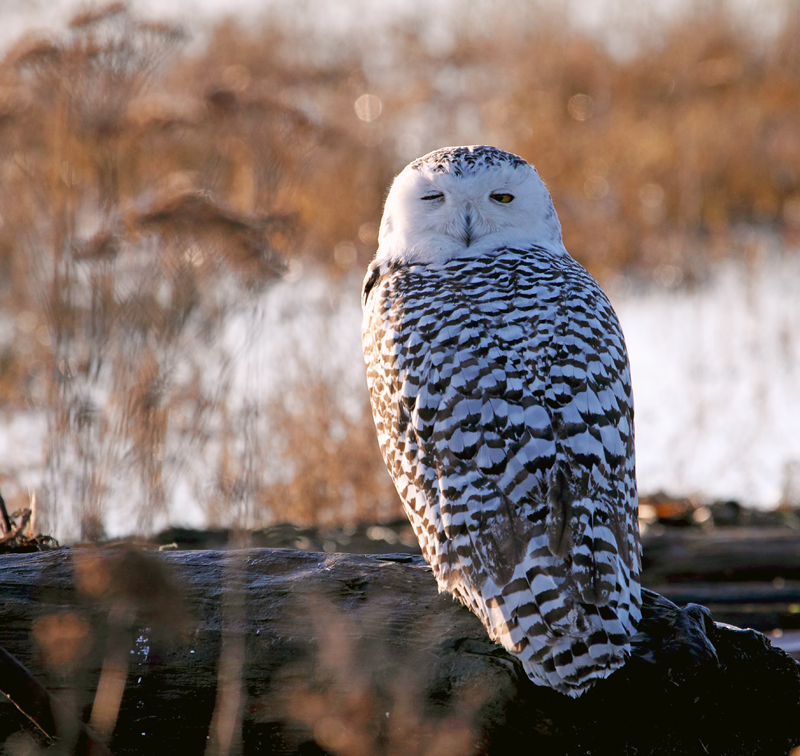 After my first visit with the snowy owls of Boundary Bay, I went back to Delta, B.C. to visit with them again at the end of January. Now it's March and I hear they're still there along the beach by the dyke but I have no idea how long they'll stick around. Apparently there was something of a population explosion of snowy owls due to a good supply of lemmings last year so many breeding pairs ended up hatching as many as seven young ones (compared to only two hatchlings normally). This has driven mostly adolescent males to the south in search of better food supplies. Apparently this happens every six or seven years. 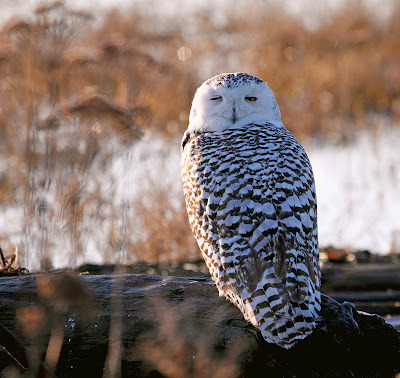 By the way, the adolescent males and female snowy owls have the dark markings and mature snowies are more pure white. 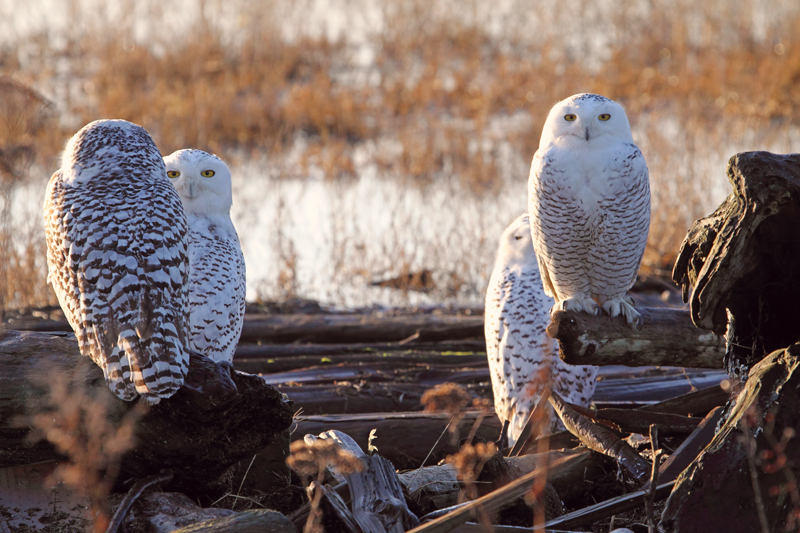 I drove out to the provincial park early in the morning to visit with the owls and spent some time with this group that was perched on some driftwood. I was amused by the owl in the background on the left...he kept his eyes on me most of the time. I decided to focus on the pair of owls on the left. 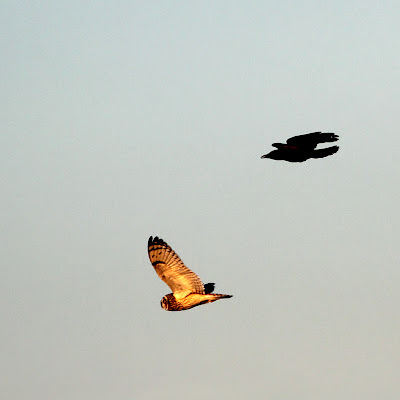 Eventually the owl in the back flew off, leaving his buddy to observe me casually with one eye while he roosted. 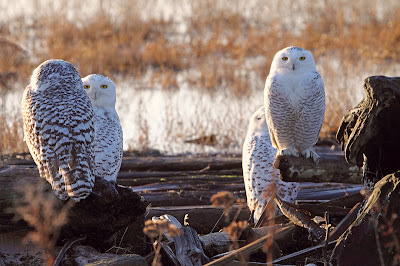 Snowy owls weren't the only owls that I saw during my visit to Boundary Bay. I was also treated to a short-eared owl's hunting session as it flew over the field along the dyke, gracefully dipping into the high grasses occasionally but never catching anything. 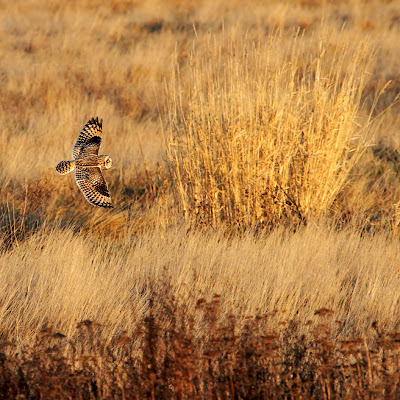 It was my first-ever short-eared owl sighting. 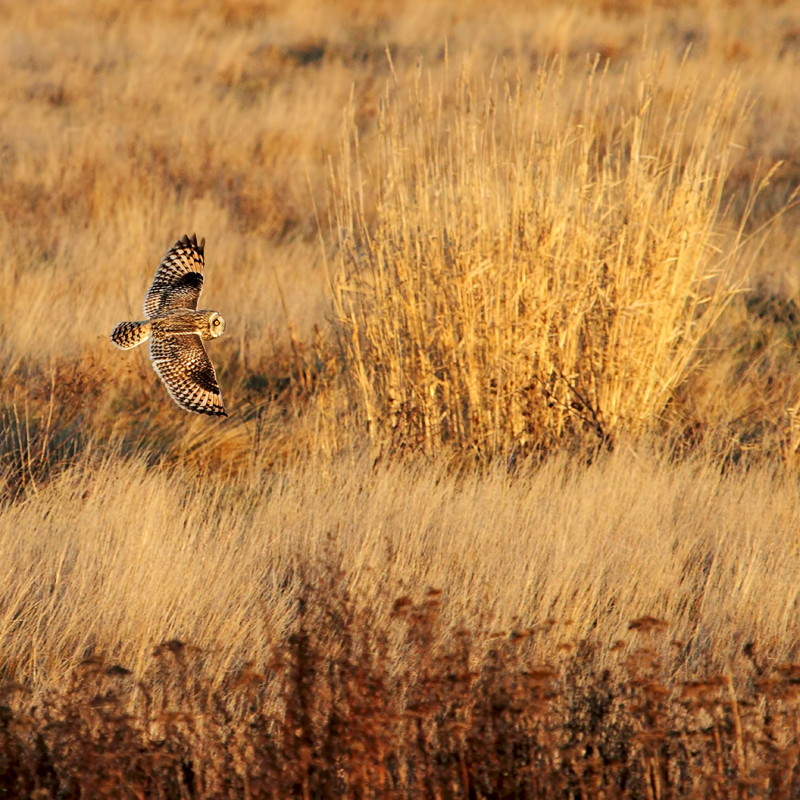 ﻿The owl was a fair distance away so I've cropped this picture down considerably. I love the way he matches the golden tones of the field in the early morning sun. The owl didn't manage to catch anything while I was watching though. He didn't have a chance...a pesky crow came along and chased him off. The two of them flew off into the distance. I've seen crows (usually gangs of them) chase off hawks many times but this was my first time seeing a crow pursuing an owl. 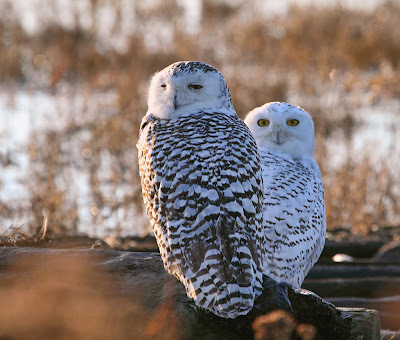 Labels: owls "snowy owls" "snowy owl" "short eared owls" "short eared owl" "boundary bay owls" "boundary bay snowy owls" snowies "owl pictures" "owl photos" "owl picture" "owl photo"
You focused on the pairs of owl, that's you were able to take a perfect shot. That's so beautiful! Thanks for your comment! I'm wondering if the owls are still around the area but haven't been able to make it back. Flower Photos ~ Time for Some Spring Color!